For some reason, I'd gone my whole life until the age of 21, without ever eating baked chicken thighs. My mom cooked chicken in a few different ways: breasts or drummettes (top portion of chicken wings) breaded with Bisquick and butter, or pan fried plain in vegetable oil (to be added to stir fry). Never, though, did my mom ever just cook chicken thighs. Then I started dating my husband and having dinner occasionally over at his mom's house. 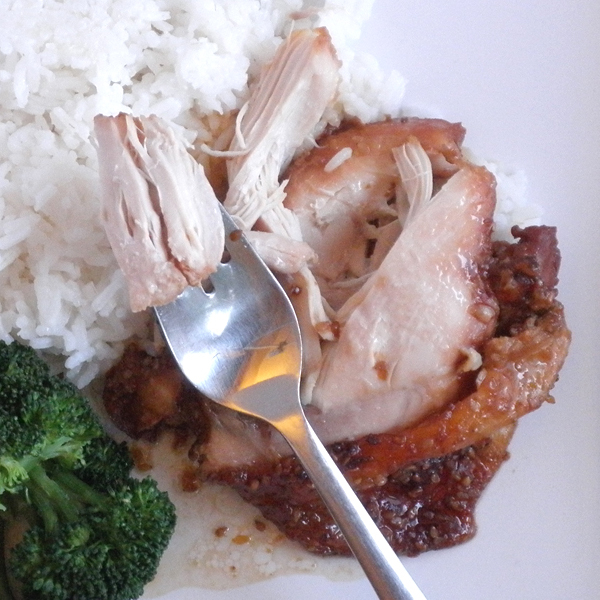 Mom Marian always used barbecue sauce on her baked chicken thighs, and that's what I normally use too. There's so much fat in a chicken thigh (when you leave the skin on, that is), that what you end up is this tender, juicy, flavorful chicken that's been baked in its own fat. The top gets a little brown and the meat melts in your mouth. Mmmm...so good. Tonight I decided to mix things up and try using some Soy Vay Teriyaki Sauce. It was tasty, but not as good as the barbecue sauce. The baking method is the same no matter what sauce you use, though, so use what you like. It's an easy, delicious dinner that's also super the next day for lunch. If desired, trim off excess skin/fat from chicken thighs. (If you leave it on, it just makes it that much better.) Place thighs skin side up in a casserole dish. (I like to use my Pampered Chef Covered Baker.) 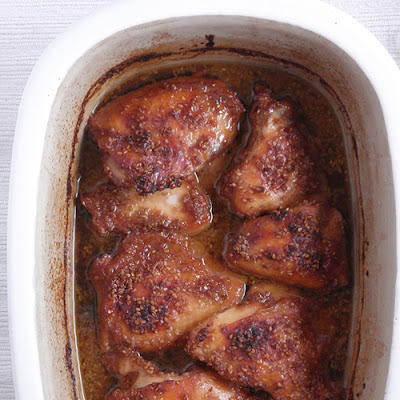 Pour sauce evenly over chicken and spread with the back of a spoon to cover tops of thighs with the sauce. Cover with lid or aluminum foil. Place in oven and bake at 350 degrees for about one hour, or until meat pulls away easily from the bone. Remove lid/foil the last 15 minutes of baking to brown the tops of the thighs.